in Cómpeta in Spain where i recently took part in a conversation between systems engineers and systems theorists, the basic question was touched: what is systems practice? what is the relationship between systems science and systems engineering? my answer to that is: humans stand in practical relations to real-world systems, as they face problems when being appetent in the face of systems that afford being treated in specific ways only to facilitate desired outcomes. systems science is the scientific way of understanding systems and understanding systems has one practical aim: to guide practice. systems engineering as well as systems design as well as systems management and whatever is the name you give to those activities that build upon the knowledge of systems and builds up technological knowledge, that is, knowledge that transforms the knowledge of systems into knowledge of how to intervene in the systems such that those interventions yield desired outcomes – all these activities belong to systems science. technological systems knowledge is just one part of the overall systems endeavour. together with empirical and theoretical systems studies it forms part of a bigger whole, the systems science(s), irrespective of whether or not any part is aware of that. 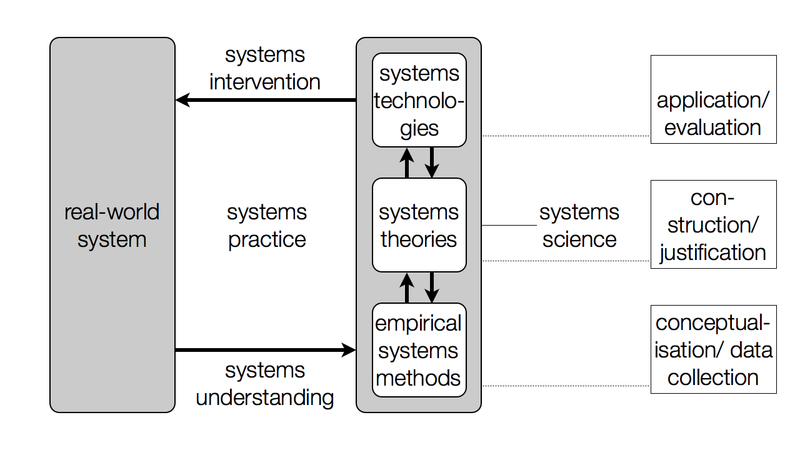 systems technology is the praxiological part of systems science, while systems thinking in theoretical terms is its ontological part and the methods of investigating systems are its epistemological part. altogether they contribute to the scientific change of real-world systems. and the better they are aware of each other, the better they reflect their role in the edifice of science, the better they connect to each other, the better will the science-based outcome of societal intervention be. what i’m doing is to specify Rosen’s natural system as real-world system whatsoever and specify his formal systems as systems science that models the real-world system; to specify Rosen’s encoding as systems understanding and his decoding as systems intervention; the whole loop then becomes systems practice. 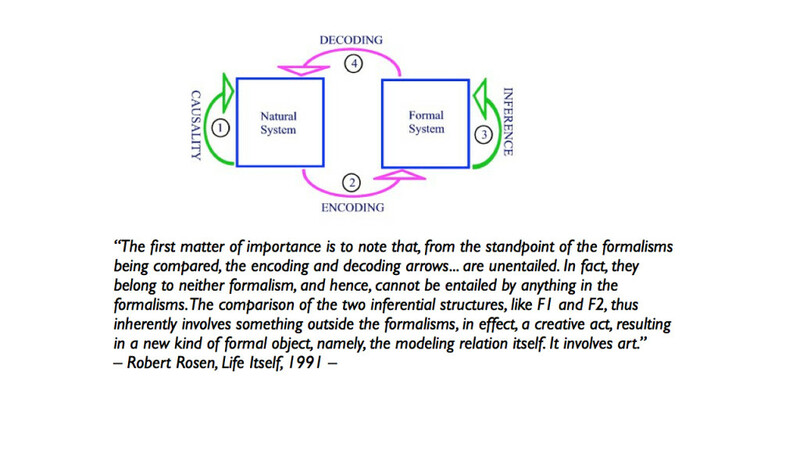 now, not only are systems understanding and systems intervention societal (social, human) activities that cross spheres of different qualities and thus inextricably inhere emergence; but also within the modeling activity, the systems science on the right hand, there are leaps of quality when transgressing from one layer to the other and ergo are no logically, mathematically, algorithmically compelling entailments possible in its entirety. simulations etc. are only subordinate parts in the emergent modeling process of science (including technology).